If you’re interested in booking the voyage of a lifetime, something you can tell friends and coworkers about when you return, then Captain Moe’s Lucky Fleet has the trip for you. To make dreams come true and build new experiences, we regularly bring fishermen out for Key West shark fishing throughout the region. 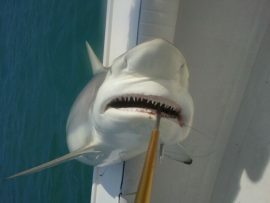 We’ve helped vacationers and experienced fishermen alike catch the shark of their dreams. Key West is home to numerous species, all of which are a challenge to finally bag. Hammerhead Sharks – These underwater beasts are relatively rare and extremely powerful. This species of shark grows to be around 6 to 12 feet in length and weighs up to 700 pounds in adulthood. Bull Sharks – Bull Sharks received their name due to their head-butting behavior. The species grows up to 9 feet in length and can weigh up to 400 pounds. American Sharpnose – The American Sharpnose Shark is a long-snouted shark that is relatively small at just 4 feet in length. They are quite common throughout Key West waters. Black Tip Sharks – These fast sharks receive their name due to the color and style of their fins, which resembles black paint. The species varies in size from between 2 and 6 feet in length. If Key West shark fishing is an item on your bucket list, there has never been a better time to book a charter than right this moment. At Captain Moe’s Lucky Fleet, we perform short 4-hour trips and all-day, 8-hour fishing trips. Whatever you fancy, we can accommodate! To book a Key West shark fishing trip that you’ll remember forever, contact Captain Moe’s Lucky Fleet by calling 305-304-8065. In fact, our expert crew will get you on the water in no time!